Fylde boss Dave Challinor told his players they must improve to realise their dream of playing in the Football League. The Coasters boss said: “At the end of they day they were better than us and we didn’t deserve anything from the game. We were beaten by a team that ran more than us. The two midfielders joined in and the front three were a real threat. They competed better, chased lost causes, won second balls and played at a real tempo. We didn’t do that. We didn’t win enough individual battles and we lacked quality. We got to half-time just one behind, which was very fortunate in my opinion. We could have scored ourselves because we had some good opportunities on the break, and if we had gone in 4-3 down that would have been a fairer reflection of the first half. 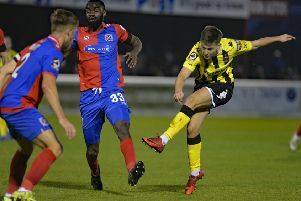 “If Maidstone had produced that application and determination throughout the season I think they would be up there challenging rather than at the wrong end of the table. “The second half was an improvement but it was too little, too late. I could have made seven changes at the break. We had enough experience in that team to deal with situations and games like that. “We have players who want to play in the Football League. Well, they will need to be much better to achieve that. “The fact that other results have again gone our way sometimes makes it better and sometimes makes it worse because you start thinking about ‘if and buts’.